Pimples out in FORMULA DONIC technology The DONIC pimple out programme is completed with DONIC Baxster F1-A a fast pimple out rubber sheet in FORMULA DONIC technology. The typical softness of the sponge gives a superb feeling for the ball. The BAXSTER F1-A masters ball control in slow rallies, yet gives explosive power for fast strokes. This is the result of the integrated molecular tension of FORMULA DONIC. 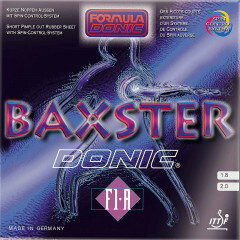 Donic Rubber Baxster F1-A is beeing added to cart.